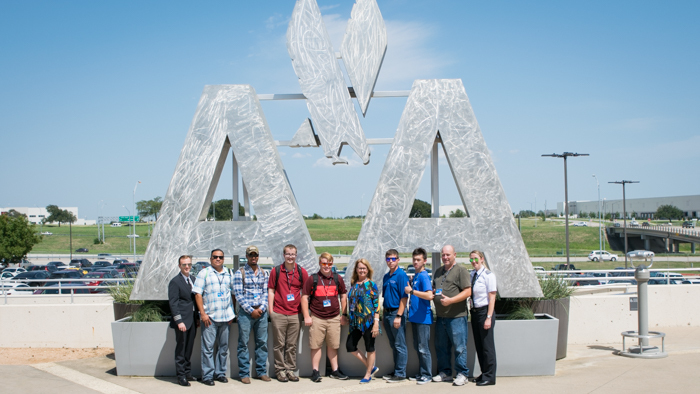 On Friday, August 17, Envoy opened its doors to eight lucky aviation enthusiasts for a behind-the-scenes look into the inner workings of an airline, as well as a tour of the American Airlines Training Center in Fort Worth, Texas. 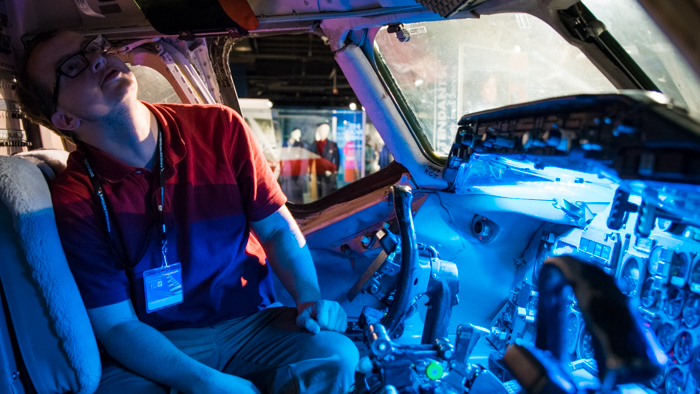 For its third year, in conjunction with American and Airlinegeeks.com to celebrate National Aviation Day, Envoy had the pleasure of hosting the tour and providing as much aviation insight as its visitors could handle. Among the group were people of all ages from as far as South Carolina, and a father-son duo who both served in the U.S. Army. The day began with a tour of Envoy’s maintenance hangar at Dallas-Fort Worth International Airport where the self-proclaimed avgeeks got up close and personal with an Embraer 140. The maintenance team answered any and all questions the visitors had about the maintenance process, the engines on display and the fleet the mechanics work on every day. After the E140 was pushed back to begin it’s day of work on the DFW line, the group moved on to Envoy’s headquarters. Captain Jessica Hines and First Officer Tyler Bridge led the tour of Envoy’s training department with an inside look at the cabin trainers used by flight attendant trainees, the control simulators for the Embraer 175 and the classrooms where new pilots learn their ground schooling. Moving on to Envoy’s Systems Operations Control, our avgeeks learned all about the ‘brain’ of the operation. They met with dispatchers, crew schedulers and maintenance operators who gave them a glimpse into what it takes to keep the 24/7 operation flowing. After a quick lunch, it was time to head off to the American Airlines Training Center beginning with a visit to the flight simulators, which was definitely the highlight of the trip. Next, they got to see a Flight Attendant training day firsthand, and learned how rigorous an emergency evacuation lesson is for the amazing men and women who keep us safe in the skies. The final stop of the day was at the newly-renovated C.R. Smith museum where our visitors got to climb into the flight deck of a McDonnell Douglas MD-80, check out the majestic Douglas DC-3 Flagship Knoxville and play a few games, like the new baggage-stacking simulator. Overall, our special guests had a great time delving into their life’s greatest passion, and the Envoy team had a great time geeking out along with them.